South Korean President Moon Jae-in on Tuesday said North Korea wants to join international financial institutions like the IMF and the World Bank, telling an audience in New York that DPRK leader Kim Jong Un hopes to trade his nuclear weapons for economic development. Last week’s Pyongyang Joint Declaration saw the two Koreas agree to boost economic cooperation, with plans to resume work at the now-shuttered Kaesong Industrial Complex (KIC) and Mount Kumgang tourism when the circumstances allow it. 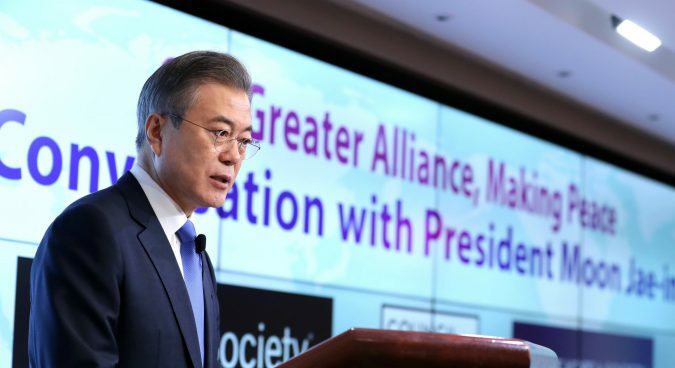 In his speech on Tuesday, Moon said these projects will “give new growth opportunities” for U.S. and South Korean companies. When asked why Kim Jong Un has chosen a different path from his father, the late North Korean leader Kim Jong Il, Moon said Tuesday that Kim the younger’s attitude was very different from his predecessors. Citing Kim’s comments, Moon restated his belief that Kim Jong Un has a “sincere desire to abandon nuclear weapons” in exchange for economic development once the U.S. provides security guarantees. “I’m well aware that many people all around the world say they can’t still trust North Korea, or it’s trick, or it’s an attempt to buy time despite North Korea hasn’t taken various measures for denuclearization,” Moon quoted Kim as having told him. Pyongyang has nothing to gain from swindling or buying time, the North Korean leader reportedly said. “The U.S. will make strong retaliation if we do, and how can we handle such retaliation? Please believe [our] sincerity this time,” Kim was said to have added. 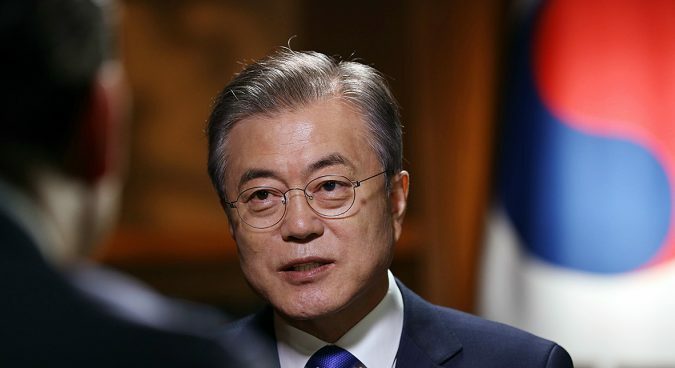 In a separate interview with Fox News, Moon on Tuesday also said the denuclearization process will be accelerated if the U.S. commits to providing Pyongyang with security guarantees and re-establishes DPRK-U.S. diplomatic relations. “This is why I believe the North’s timetable for completing the denuclearization within the first term of President Trump is not something that’s unachievable,” Moon said in a full text of the interview provided by the South Korean presidential office. 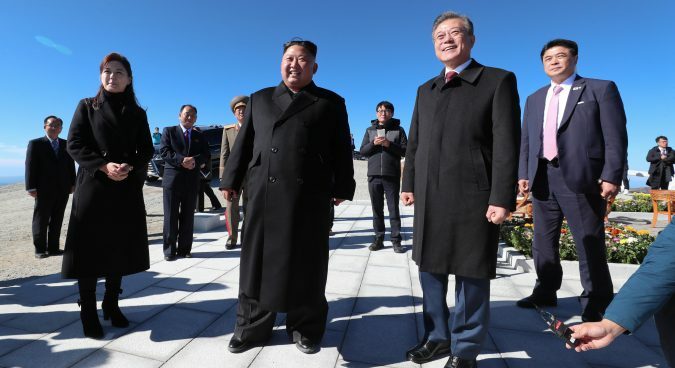 Moon also said that the “corresponding measures” mentioned in the Pyongyang Joint Declaration as a condition for the full decommissioning of the Yongbyon nuclear research center wouldn’t necessary mean the relaxation of sanctions. The U.S. could take various measures to end hostile relations, he explained, including an end-of-war declaration, humanitarian assistance, the establishment of a liaison office in Pyongyang, and exchanges of economic delegations and art troupes. In his interview, Moon said he had “sufficient discussions with President Trump” on prospects for an end-of-war declaration during Monday’s ROK-U.S. summit, expressing his hope that the issue will be discussed at an upcoming, but not formerly scheduled, Trump-Kim meeting. The South Korean President also reiterated his view that a peace treaty will have no impact on the stationing of United States Forces Korea (USFK). “I believe the United States Forces Korea will need to stay after a peace treaty is signed, and even after the two Koreas achieve unification, for the stability and peace of entire Northeast Asia,” he said.